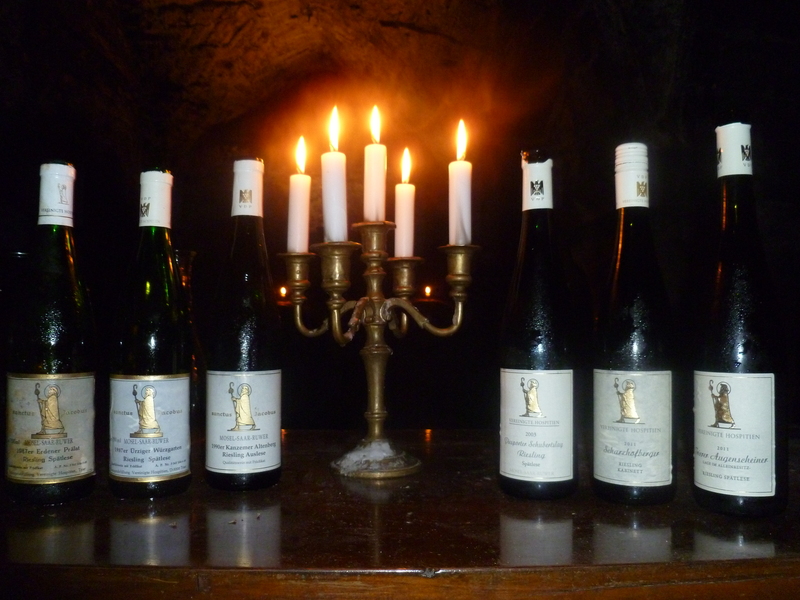 Finally, here are the tasting notes for our awesome tasting at Vereinigte Hospitien in June. 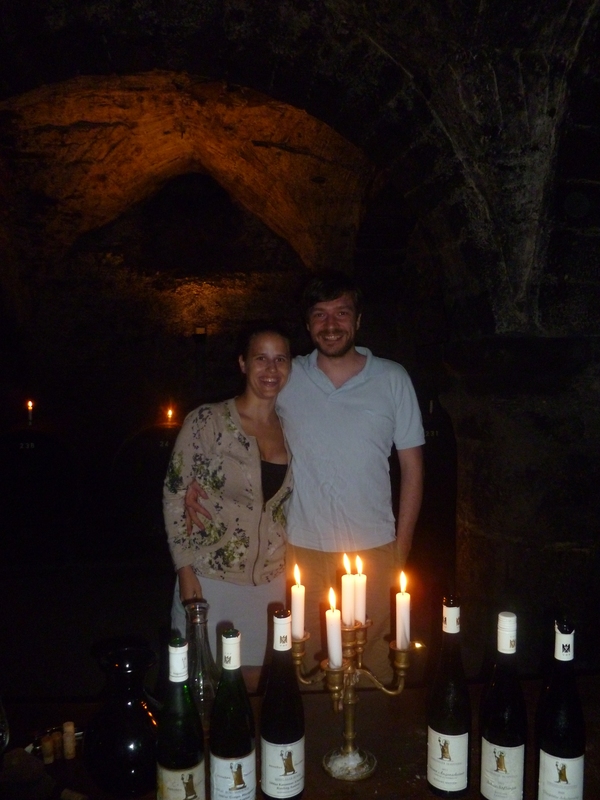 As you might remember (if not, here is the initial report), we were sitting in Germany’s oldest wine cellar (the walls dating back to the 300s A.D.), soaking in the awesome atmosphere as our host Marc was picking up some bottles to try. And he did not let us down! We began with a tasting of two 1987 wines from two of our favorite vineyards: Ürziger Würzgarten and Erdener Prälat. It is Nina’s birth year and Marc had learned that from the blog. We had tried the Erdener Treppchen Spätlese before, so now we were able to compliment this tasting experience that I described here. Just think about that: we were able to try three similar quality wines from three connected vineyards of a 25 year old vintage. Maybe it is just me, but I get pretty excited about that!! Both wines were spätlesen and they had remarkably similar profiles. The Ürziger Würzgarten had 10.4 grams of acidity per liter, with 41 grams of residual sugar; the Erdener Prälat was slightly higher in acidity at 10.5 grams and sweeter with 45 grams of residual sugar. At 84 degree Oechsle (a scale to measure the sugar in the harvested grape), it had the highest Oechsle for any of their spätlese in that year. The Ürziger Würzgarten’s nose was flowery and fresh, one could say a typical nose for this vineyard. On the tongue, it had a sizeable amount of acidity, which gave it an incredibly fresh taste. The acidity persisted throughout the tasting. It was hard for me to discern what fruits I tasted. The Erdener Prälat was remarkably well preserved. The nose was full of peach and once the wine reached our mouths, it broadened out, fully taking command of our taste buds with peach and apricot. The acidity only appeared more towards the end. It had a long finish. It was interesting to see how different these two wines tasted. You could definitely tell the terroir in them, but the higher residual sugar in the Prälat probably helps explain why the acidity was less pronounced in it. Another interesting thing we learned was that Vereinigte Hospitien did a chemical analysis of the Würzgarten and it produced a fascinating result. One thing that you hear over and over again when tasting older rieslings is that they tend to be more balanced, because the sweetness goes down and the acidity stays, so the wines become less fruit-pronounced. However, the chemical analysis showed that the amount of sugar in the wine had not gone down – at all. There was still the same amount of sugar in the wine! We just do not taste it anymore. Apparently, there is no real explanation for that. One guess is that the sugar transforms into longer-chained molecules that our taste buds cannot taste…crazy, right? We then went for a 1990 Kanzemer Altenberg Auslese. Kanzem is at the river Saar, a small contribuary that meets the Mosel just south of Trier. Saar wines are usually more mineralic and have higher acidity levels than the Mosel, which makes for very interesting wines. Kanzemer Altenberg is one of the top vineyards along that river. The bottle had been recorked. 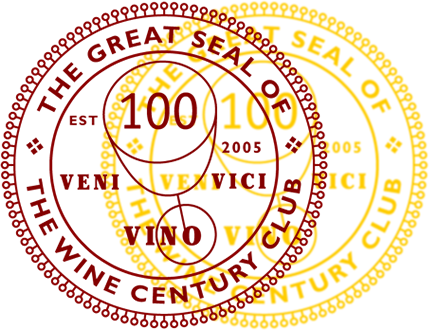 The wine has 52 grams of residual sugar, harvested from fully ripe grapes. Upon opening and pouring, we saw a dark orange wine, with a salty and sherry like nose. On the tongue it was weirdly metallic, some hints of passion fruit. It then fell flat fast. We decided the bottle was flawed (actually, Marc, who knew how it should taste decided…but it did taste odd). The second bottle we opened was very different: lighter in color, the nose full of gooseberry. On the tongue, it had a fabulous acidity, lively fruit notes and just gave us a great mouth-full of wine. The texture was wonderful. A great wine! We then tried a 2011 Scharzhofberger Riesling Kabinett. The Scharzhofberg is the Saar’s most famous vineyard and its wines rank among my favorite. It has a hard to describe terroir note to it that I just find incredibly endearing and comforting. This one did not let us down. At 88 degree Oechsle, this Kabinett is actually a wine that could have been labelled as an Auslese, two spots higher. It has 9.8% ABV. The nose was fruity and flowery. On the tongue I tasted banana and apricot, with a looooong finish. Just a very decent, yummy wine. 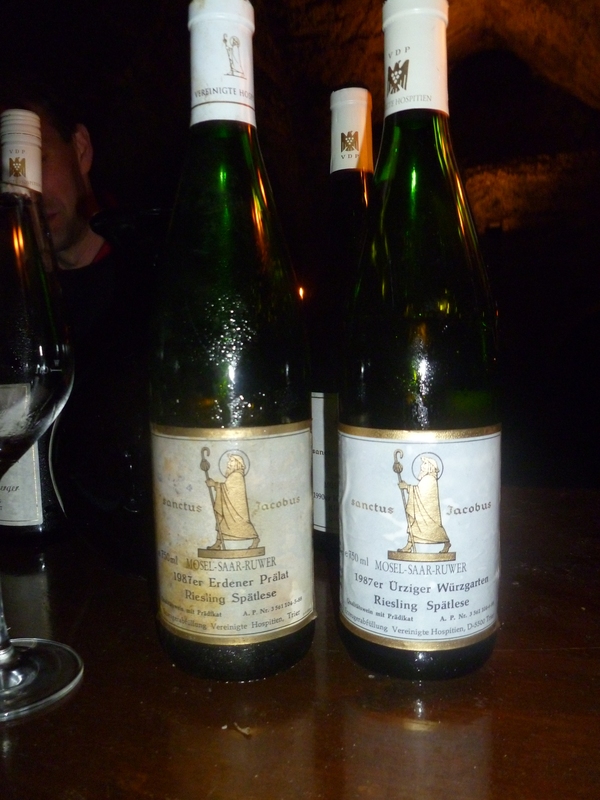 Nina’s highlight, and I was pretty impressed, too, was the 2003 Piesporter Schubertslay Riesling Spätlese. Initially a single-owned vineyard by Vereinigte Hospitien, they are now leasing some out to other winemakers. The color was light and fresh. The nose full of strawberry and cream, with vanilla thrown in. On the tongue, the same tastes prevail. The sweetness is wonderfully balanced by a fresh acidity. Later on, we tasted caramel notes creeping in. Long finish, too. It was such a fun wine. We have had another bottle since, and that was just as good. A great wine at a great price ($15).